Is There Any Hope For The Last Place Buffalo Sabres in 2012? 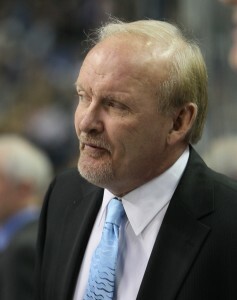 Lindy Ruff needs to do work to lead the Sabres to the playoffs this year. 2011/2012 were supposed to be the season where the Buffalo Sabres finally picked themselves up, took all of their potential and made a push for the franchise’s first ever Stanley Cup victory. Instead, it’s been an absolute train wreck filled with blown potential, mountains of injuries and, in February, a stint in dead last of the Eastern Conference. Currently, the Sabres aren’t dead last after Sunday’s 6-2 win over the Pittsburgh Penguins but are still stuck in 14th place in the Eastern Conference, with only the Carolina Hurricanes behind them. Buffalo are seven points out of the last playoff spot in a parity-filled Eastern Conference with a 25-27-7 record. After hitting the lowest ebb of the season as they struck last place a week ago, can the Sabres make the playoffs in 2012? The Sabres schedule isn’t helping their case for their last 23 games. Over half of the games (14) are on the road, with tough tussles against teams like the Canucks, Bruins and Rangers in March. Fortunately for the Sabres, they’ve gotten a lot healthier recently than they were earlier in the year, great news for a team that runs without a true superstar on it and thrives getting goals from all sources. After Terry Pegula allowed Darcy Regier free reign to buy whoever he wanted in the off-season, the Sabres loaded up on big contracts for guys like Ville Leino and Christian Ehrhoff, which has left them bloated in paychecks and with little room to make trades, though there have been some very interesting rumors regardless. It may take a Miller to Chicago for Kane style trade to get the Sabres back in contention, and something like that might even push them up to playoff contention. The maddening thing about the Sabres is that they continue to play great games like they did against the Penguins, but only days after playing absolutely terribly. Inconsistent would be a kind term to use for Buffalo so far this season, the injury plagued first half of the year aside. If the Sabres could string together wins like the Penguins victory a few games in a row, they would be right back into the playoff picture but it looks less likely every time the Sabres show up and drop a winnable game. Coach Lindy Ruff’s seat has been getting hotter as the worst Buffalo Sabres season in a good, long while has escalated. If he wants to keep the seat that he’s coached over 1000 games with the Sabres in, he’s got to help lead his team to a playoff berth. After all, they supposedly have the talent to be there no matter how injured or unlucky they were.